Les Regains is a lovely 3-bedroomed apartment in an Alpine chalet set in its own spacious garden, close to the town centre and the lifts but on a quiet residential cul-de-sac. The kitchen has been recently refitted. The chalet is situated just off the Route de Thonon, 700m from the Super-Morzine telecabine and the town centre. Ideally for self-caterers, Les Regains is just 2 minutes walk from the well-stocked Casino supermarket. 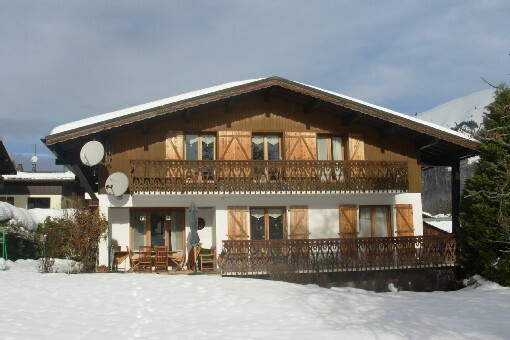 The apartment is spread over the whole of the first floor of the two-storey chalet. There are three bedrooms (one is ensuite) and a bathroom with bath and separate WC. The large king bedroom has a sunny balcony; there is triple bedroom (single bed and double bed) and a bunk bedroom with ensuite shower, basin and WC. (See floor plan at the end of the photo gallery). The large L-shaped living/dining room and open plan kitchen all open onto the sunny front balcony with lovely views of the summits of Nyon, Ressachaux and the Dents Blanches in Switzerland. The living area has two comfortable sofas one of which converts into a bed, best suited to one person. There is a ski and boot storage area downstairs and 2 dedicated parking places 10m from the front door. There is a free ski bus line (line 'U') which runs in a circuit and stops at the bottom of the lane 50m away. Secure storage is available for mountain bikes, with a trough for bike (and rider!) washing, and there is a wonderful large garden for summer sunbathing! Please note that Summer High season rates run from 7th July - 24th Aug. Before and after these dates is low season.